The word Prego in Italian refers to the “welcoming” and that it does! “Prego, entri pure” (please come in). 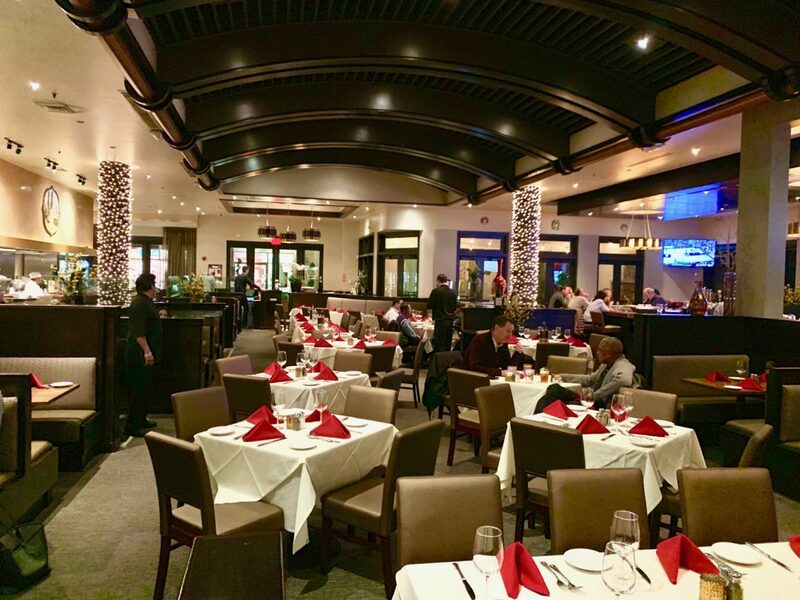 And if you have not visited Prego Mediterranean in its newer location at The District at Tustin Legacy, come join the fun. Husband and wife team Tony and Ruth Lee Bedi are a passionate restaurant owner team and together with renowned Chef Ugo Allesina and Sous Chef Victor Sanchez, they are rocking it at The District. The dining room is stunning—-rather expansive with high ceilings and seating up to 250. I just love how the red napkins stand at attention at each place setting adding a dash of color to the natural wood tones. The bar is perfectly positioned to the left, with six flat screen TV’s for sports viewing and cocktail, wine and beer toasting. This has a cosmopolitan vibe with lively exhibition kitchens allowing diners a peek in as the artful chefs create their delicious magic. There is also a private dining room offering the perfect setting for wine dinners, cooking classes and private affairs. These are coveted quiet spots in Orange County for a more intimate evening experience. 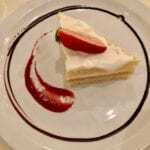 The menu emphasizes regional Italian cuisine, featuring salads, authentic pizza baked in a wood-fired oven, freshly made pastas, grilled fresh fish, pit-roasted meats & fowl. The homemade desserts and pastries are divine, so do save room for those. They offer a full bar and are proud of an extensive list of wines from Italy and California. Prego has received fine-dining awards from the Restaurant Writers’ Association and the Wine and Food Society of Southern California. A Tip On Parking: There is an easy entry to the restaurant from a huge parking lot if you enter on Von Karman. They offer easy valet parking Thursday, Friday & Saturday evenings. The restaurant is just steps away on the left as you enter the promenade. I recently read a wonderful interview with Chef Ugo and if you want to learn more about him, do take a look at this insightful chat. It is always so interesting to me how chefs fall in love with cooking! Below I wanted to share with you, my readers, all about a recent Cooking Class and Demonstration I attended at Prego, upcoming events and even a recipe from Chef Ugo! Our Cooking Class included numerous demonstrations by the Chef, recipes, a delicious three course dinner, and paired wines with each course. There was lively banter with the guests, fun stories and culinary insights by the chefs, and the best part of all is that every item was so delicious. It was impressive. Chef Ugo Allesina welcomed us all and like a mother hen, introduced Sous Chef Victor Sanchez and oversaw the evening activities. He has an injured shoulder so his mobility was somewhat limited. Poor guy! But we were in excellent hands with Chef Victor. A fresh Italian Salad was presented first, as we sipped a lovely white wine. 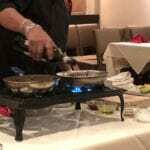 Chef Victor worked up Crepes with Bechamel Sauce which were prepared tableside for us and he made it all look so easy. These puppies were filled with Ricotta, Mozzarella, Boursin (a soft cheese), Spinach and Prosciutto. It was then dressed with a delicious Bechamel Sauce (which I know for sure is not on my Weight Watchers list). This was placed under a broiler for just a moment to lightly brown the platter. He explained each step as he went along and I took notes. 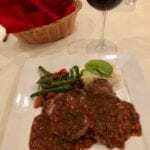 Then we enjoyed Vitello al Chianti which was just a delicious entree. He demonstrated how he flattened and tenderizes the slices of veal. My favorite part was when he dramatically deglazed the pan with the Chianti wine. It just sizzled and patiently awaited the butter and other ingredients to create the rich sauce in mere moments. He shared with us many possible additions for the wine sauce, including: capers, artichokes, and mushrooms which are among his personal favorites. The pinnacle of the evening was the delicious Limoncello Cake with whipped cream. It was light and so flavorful. I don’t even eat desserts and I had this one gobbled up in no time. Each course was perfectly paired with a choice of red or white wine. It was a delicious evening and I would order every single item they presented to us. See below for a special recipe from Chef Ugo! -Now pour a 1/4 cup of the mixture (or less depending on size of the pan) into a heated non-stick pan. Rotate the pan to coat the bottom of the pan with the mixture. 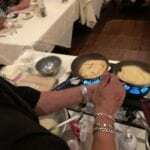 Use a spatula to gently lift the crepe and flip it over to cook both sides. -Stack them up one by one onto a plate to be used shortly. -Place a Crepe on the plate. -Warm milk in a heavy saucepan over medium heat. Do not let it come to a boil. Keep it warm over very low heat. -To make a roux, melt the butter in a separate saucepan over low heat. When it is bubbling, add the flour and whisk until it forms a golden paste, about 3 minutes. -Whisk constantly and add the hot milk in a steady stream. Bring the mixture to a gentle simmer and continue to whisk until the sauce thickens. About 10 minutes. -Whisk in the cheese and a pinch of nutmeg and/or herbs (if desired). They use Doordash for local deliveries. 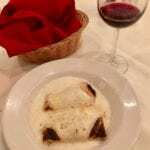 Prego Is Stirring Up Some Excellent Italian Cuisine & Events! What fun to enjoy a Custom Cooking Class with Chef Ugo Allesina at Prego! Girlfriends gathered in the Private Dining Room and had a grand time learning his "tricks of the trade"...well at least some of them.